It was inevitable really. After the humiliation of dodging Iraq because the Army said it was 'too dangerous', an attempt at face saving was only a matter of time. Afghanistan is considered much safer than Iraq, with the Independent noting that "The main British base in Helmand, Camp Bastion, has never been attacked, unlike its equivalent in Iraq, Basra air station. Even the forward operating bases in Lashkar Gah, the provincial capital, and Gereshk are reasonably safe." The official excuse for withdrawing Harry was because of a media leak. However, an Australian Yahoo site broke the story some weeks back, and there had been much speculation in the media last year that Harry would be sent to Afghanistan as his regiment was scheduled to go. Perhaps the MI6 spooks have inside knowledge that Al Qaeda get their celebrity news exclusively from the Drudge Report? Harry spent just 10 weeks in Afghanistan, meaning he was posted some time around Christmas. 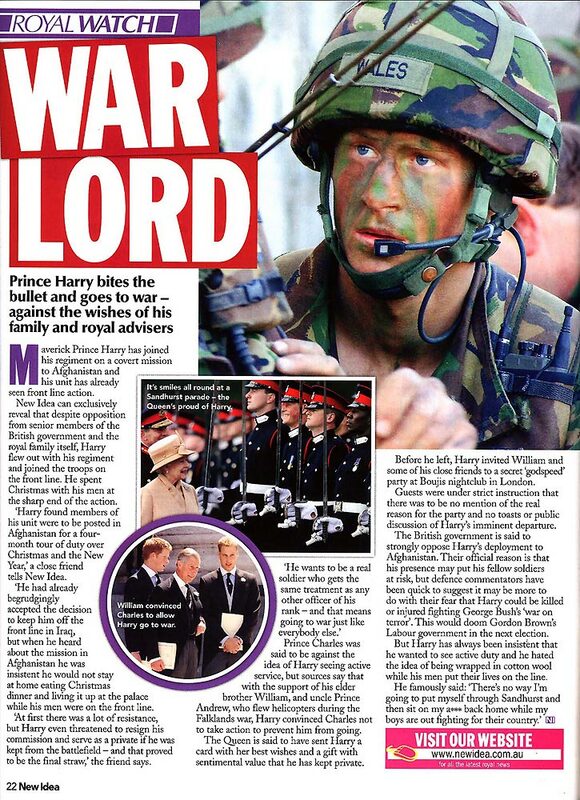 In contrast, the rest of his regiment were reportedly posted to Iraq in October 2007 and had been there over 2 months by the time Harry turned up. So if the leak was the reason for him returning early (and the fact there were other leaks suggests it was not), what was the reason for him deploying late? Quite probably Harry's late posting and early return were planned from the start to minimize the chance of any real 'action'. It is widely known that hostilities die down in Afghanistan as the winter bites, resuming in the spring. Indeed this year will likely be no exception, with the Taliban's military commander just a week ago warning of a spring offensive. "The attack is imminent," he told Al Jazeera's Arabic channel in an interview aired on Wednesday. "The number of Taliban mujahidin who are ready to launch the spring battle has reached 6000," he told Ahmed Zeidan, the Kabul bureau chief of Al Jazeera's Arabic channel. So in order to avoid real risk, any deployment would have to be made to the safest theatre (Afghanistan) and at the safest time (from December to February) regardless of what the rest of his regiment were doing. And despite Harry supposedly doing real soldiering, it turns out he was followed by a bunch of media lackeys filming the whole thing. What is the betting there were no gun fights? Not even a couple of caged Taliban trucked in and let loose as a bit of sport. Meanwhile the bodies of real troops who have died fighting in Afghanistan and Iraq continue to return without any media attention whatsoever. Nhiều người dành 8 giờ ngồi ở một chiếc ghế xoay văn phòng tại tpHCM mỗi ngày - lâu hơn thời gian ngủ trên một tấm nệm!Mua ghế xoay văn phòng tại tpHCM tốt nhất ở đâu? I appreciate your efforts in preparing this post. oshelponline I really like your blog articles.